Preheat oven to 175°C/350°F. Beat butter in a large mixing bowl until fluffy and slowly add the sugars. Add honey and eggs. Add vanilla extract, espresso powder, and salt. Mix flour, cornstarch, baking powder, and baking soda in a separate bowl and add alternately with two thirds of the whiskey to the wet ingredients. Mix everything to a smooth batter, place in a greased and floured bundt pan and bake at 175°C/350°F for approx. 45 min. Allow the cake to cool for approx. 30 min. For the icing, whisk together the brown butter and confectioner’s sugar. Add the sour cream, remaining whiskey, and salt and whisk until completely smooth. 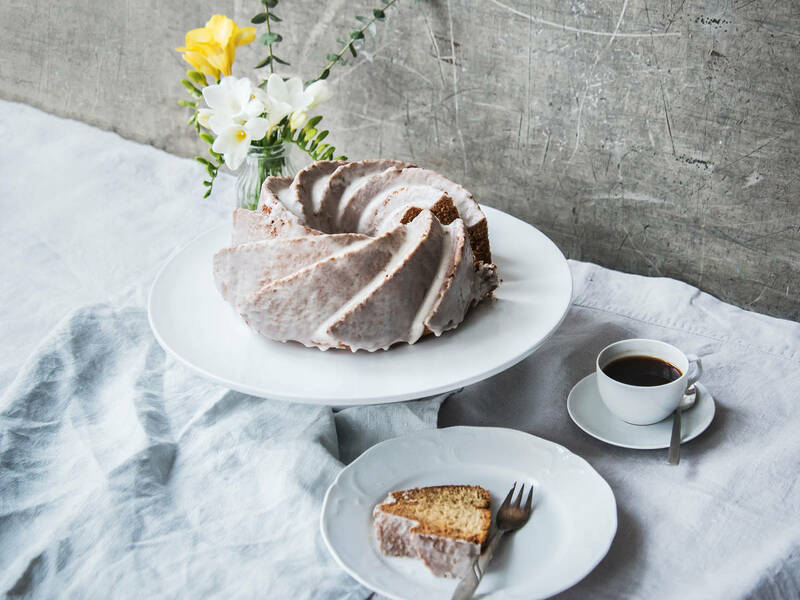 Flip out the cooled bundt cake. Pour icing over the cake, and enjoy!